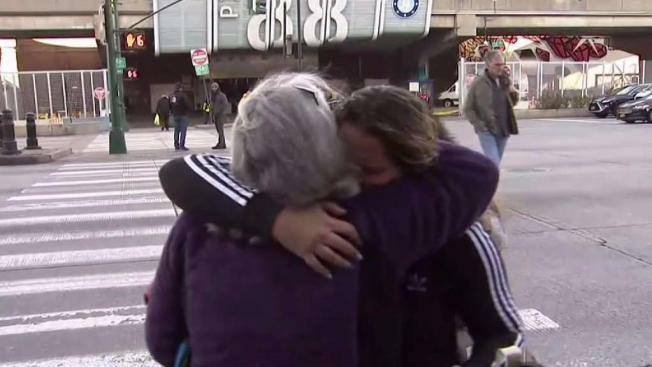 An 11-day tropical excursion that turned into a weekslong nightmare for some travelers has ended, with relieved passengers stepping off their cruise ship, at least one of them in tears, at Pier 88 in New York City Tuesday. The Norwegian Cruise ship left on Halloween and was due back on Manhattan's West Side on Nov. 11, but its propulsion system failed about six days later in Barbados. Passengers were stuck. They say they were given three options: Norwegian would fly them home, they could take another cruise from Ft. Lauderdale or stay in Barbados hotels until their ship could return. More than two dozen guests couldn't fly because of medical reasons, the cruise company said, and they were accommodated at a nearby resort with all meals included. While some say they made the most of being stuck on the island, many travelers said the trip was stressful. Kara Kaminski cried as she stepped off the boat Tuesday; she hugged her mother, who had come to pick up the Lyndhurst, New Jersey, woman and her family. Kaminski described the trip as a nightmare -- she said her entire family was separated in different hotels. Her 10-year-old son has severe allergies and needs special accommodations that weren't available, Kaminski said, adding, "so he was the one suffering the majority of the time." Another passenger, Kaminski's friend Diana Parada, says she was gone so long she lost her job at a toy manufacturing plant. She said she got an email Tuesday notifying her of the termination. "Norwegian Cruise Line sincerely apologizes for this unexpected change to the ship's itinerary and its impact on our guests," the company said in a statement. "Norwegian provided extensive support and care as needed to ensure that all of our guests were comfortable and well taken care of as they returned to New York." "The ship's technical issue has been addressed and all guests who remained in Barbados have sailed back to New York," the statement continued. "Norwegian Gem will depart this evening for her next cruise as scheduled. Norwegian appreciates our guests' understanding and patience with this unforeseen technical issue."